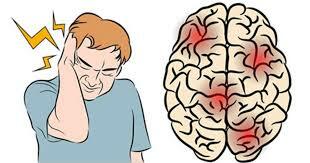 A migraine headache is a pulsating pain that usually affects one or both sides of the head. This excruciating pain is made worse by physical activity and is accompanied by nausea, vomiting, and sensitivity to sounds, light, and/or odors. Migraines generally progress through four stages, comprising of prodrome, aura, attack and postdrome. However, one may not experience all four stages. Migraines can result from lack of sleep, hunger, changes in weather, excessive stimulation of the senses, stress, or other factors. Though incurable, drugs are available to relieve pain, and to reduce the frequency and intensity of attacks. 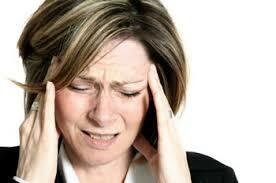 More common among women, migraines occur periodically and generally become less severe after age 50. Migraines tend to become chronic particularly in those people who have a history of excessive drug usage for treating the problem. Migraines occur more among people who have a sensitive nervous system. Along with the electrical activity that spreads across the brain, various functions, such as vision, balance, muscle coordination, speech and sensation are temporarily disturbed. These disturbances cause the symptoms that occur before the headache (called the aura). Estrogen, a female hormone, appears to trigger migraines, hence their reason for higher incidence among women. Oral contraceptives with estrogen and estrogen therapy may make migraines worse. A prodrome often occurs before a migraine. The prodrome comprises of sensations that warn people that an attack is imminent. These sensations may include mood changes, loss of appetite, and nausea. Migraines usually become less severe as people age. There are two types of migraines. Classic migraines start with a warning sign, called an aura. One may see flashing lights, a pattern of lines, colors or shadows. He/She may temporarily lose some of the vision, like the side vision. One might experience a strange prickly or burning sensation, or muscle weakness on one side of the body. The patient may find it difficult to communicate. He/She may also feel depressed, irritable and restless. The pain of classic migraines may occur either on one side of the head or on both sides. Common migraines do not start with an aura. These “migraines without aura” start slowly than classic migraines, last longer and tend to interfere more with daily activities. The pain of common migraines may be on only one side of your head. You may have a “premonition” several hours to a day before your headache starts. Premonitions are feelings that can signal an impending migraine. These feelings include intense energy, thirst, fatigue, food cravings accompanied by mood changes. Examples of medicines used for preventing migraines include certain antidepressants, cardiovascular drugs, anti-seizure medicines, botox injections including leaf and root extracts of the butterbur and feverfew plants. 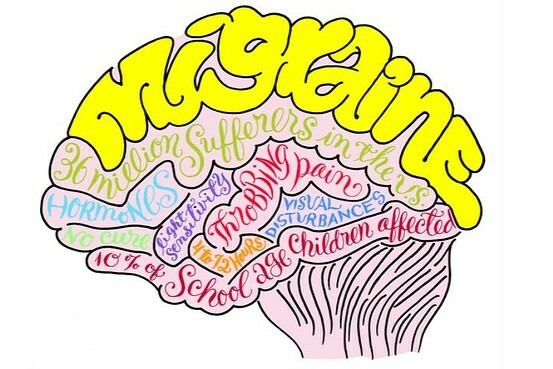 Supplements (Riboflavin, Magnesium, Ginkgolide B, Coq10, Omega 3) have shown to benefit migraine sufferers. CranioSacral Therapy – CranioSacral therapy is form of treatment that can be quite effective in treating migraine headaches. Heat & Cold Therapy – Applying hot & cold compresses to the head or neck can relieve pain & tension. Homeopathy – The SNRA molecule, delivered in small doses has also shown to be fast-acting for providing migraine relief. Essential Oils – Lavender oil has been found to be one of the best for migraine pain management. What else can I do to prevent migraines? Eat regularly and do not skip meals. Have a regular sleep schedule. Exercise regularly as obesity can cause migraines. Maintain a headache diary to enable you to monitor your migraine triggers including details of treatments that are helpful. Migraines cannot be cured, but they can be controlled. Elimination of triggers and behavioral interventions (relaxation, biofeedback, and stress management) are some of the ways of controlling migraines. Migraines are treated using prophylactic or preventive medicines and abortive medication which stops the headache from becoming severe.